How to view iPhone deleted iMessage on the computer? How to view iPhone deleted iMessages on the computer? How to retrieve iPhone lost imessages to the computer for view? How to transfer deleted imessages to computer to view? Read here. Is there a way to view a deleted imessage? I don't necessarily need to restore them, but retrieve info from them. Must I use a 3rd party app ? what is the safest one, if so? Can I do it on my desktop and simply view the content without restoring? Is are imessages automatically backed up? I can't seem to find a place where I have an option to choose. Thanks a million! So is there a way to view deleted iMesages on the computer? To conclude, this user deleted some imessages he needed and now, he wants to simply view those deleted contents on the desktop without restoring. It seems that it is not difficult to transfer all deleted imessages from iPhone to computer for view so long as under the help from a third party software. Yes, it's turn that you must need a 3rd party app to help you view iPhone deleted iMessages on the computer. Most people will be concerned about the safety of the third party software when need to retrieve deleted iMessages to view. Here, I think iFonebox is just the safest tool to help you out of the trouble. 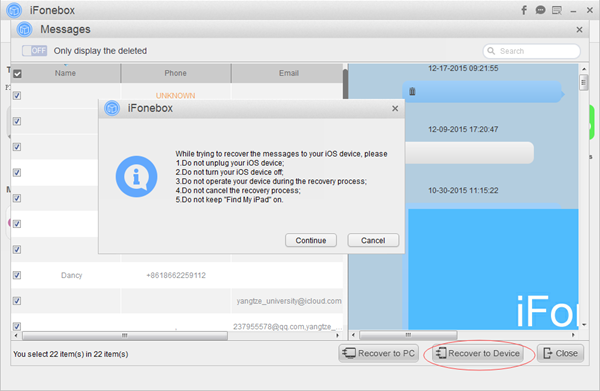 As the best iPhone text messages recovery tool, iFonebox can not only recover deleted or lost text messages, imessages, notes, wechat messages, contacts, etc, from iPhone or iPad directly, but extract and restore lost data from iTunes or iCloud backup selectively, not wiping any data on your iOS device. Plus, iFonebox supports to transfer recovered text messages, imessages back to iPhone directly, just as contacts and notes do. So amazing. Next, I will share detailed steps to help you transfer deleted iMessages to your computer aimed at viewing. But before, it is necessary to download and install iFonebox on your computer. Two versions are optional: Windows version and Mac version. How to view iPhone deleted iMessages on the computer? Launch iFonebox. Choose Recover from iOS Device mode. Remember to connect your iPhone to the computer with USB cable so as to scan and find deleted iMessages from it. Once connected successfully, your iPhone will be detected by iFonebox. If it is the first time to connect your iPhone to the computer, you need to click "Trust the computer" on your iPhone screen. Click Start button to begin. Scan iMessages from iPhone. Just click on Messages item to start automatic scanning process. iMessages is included in Messages item. Preview and select deleted iMessages to view. Now you have the chance to look at those deleted iMessages then, select them and click Recover to Mac button so as to view them on the computer. Also, if necessary, you can also put them back to your iPhone again. That's all. Within the help from iFonebox, you can transfer deleted iMessages from iPhone to computer easily just for viewing.